Quick and easy breakfast or lunch recipe you say? Coming right up! 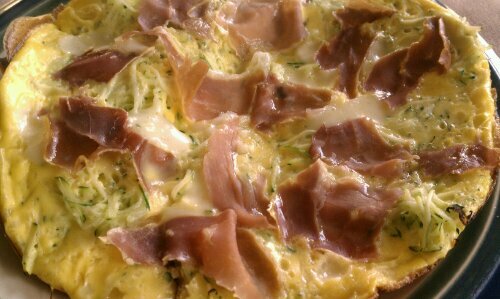 As you all know I am not one to let things go to waste, if I can help it and from my Crab Asparagus Frittata the other day, I still have Fontina laying around my fridge deli drawer. Looking through the rest of said appliance, I also have eggplants, celery root, butternut squash and zucchini that I have to cook. I think sometime at the store my love for veggies gets the better of me, or my good intention to eat more produce, who knows that so exactly? 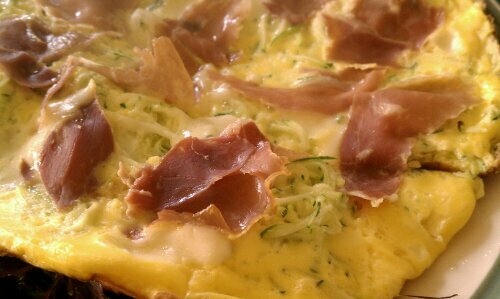 Add some Prosciutto for flavor, and using zucchini seemed the easiest for a quick breakfast. Oh, a word on the zucchini. When I was little and my family first grew zucchini in our harden, it wasn’t called zucchini, no zucchetti is what they were called. And as I learned after some basic Italian, things that end with -etto/-etti should be small or little, (just like -ini as in= smaller, younger; fratello= brother, fratellino=little or younger brother) Uhhmm, so, we did not get that memo and let the darn things grow until they resembled some sort of prehistoric weapon, yep, exactly an edible club to go hunt some sabre-tooth with. Do yourself a favor, pick them small, if you grow them. They taste better and you won’t have them coming out your ears… But I digress, the 1/2 zucchini referenced to here is going to make about a cup grated. Use a really fine mandolin slicer to julienne or shred the zucchini, otherwise you might have to turn the cooking temp down and cool a bit longer. Ah I love my pastured hen eggs that I get every week at the farmers market 🙂 Now that the grass is getting lush with spring, you can see the color of the egg yolks intensify to almost an orange hue! 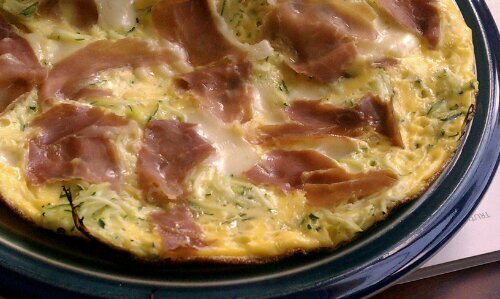 Cover the skillet with a lid, and cook until the eggs are set on top and the cheese is melted. Add some freshly ground pepper, if you like. 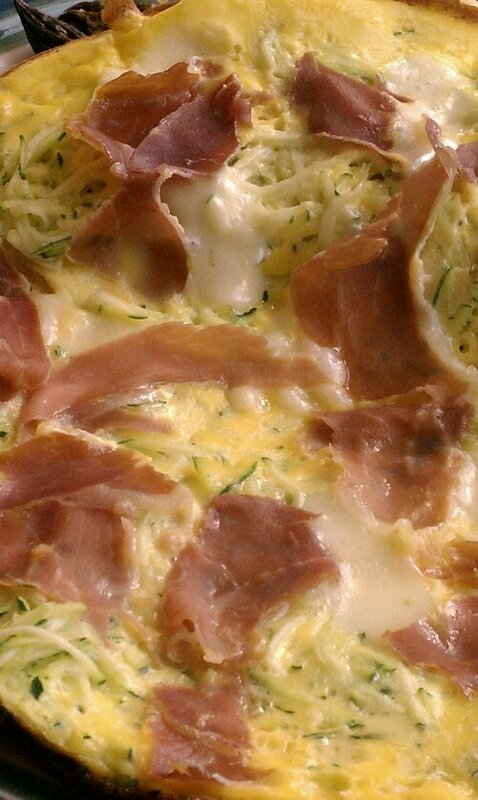 You don’t even need salt, the Prosciutto and Cheese give it enough flavor! Yum. This would be a great lunch with a little side salad!